The following is a guest post by Meaghan McBee. Meaghan is the Content Marketing Manager for ZenContent, a company that provides tailored, quality content for brands of all varieties. Say hi on Twitter or connect on LinkedIn. 2016 is finally here, and content marketers across the globe are working on social strategies that shine. New marketing challenges may bring a fresh range of tactics for your brand to tackle, but where should you even start? Engagement, customer loyalty and brand awareness are top goals for marketers this year. A lot goes into achieving those goals, including a calculated blend of analytics, budgeting and customer feedback. Fortunately, crafting a Zen strategy for your brand is simple with a solid content marketing plan that follows goals and top trends. 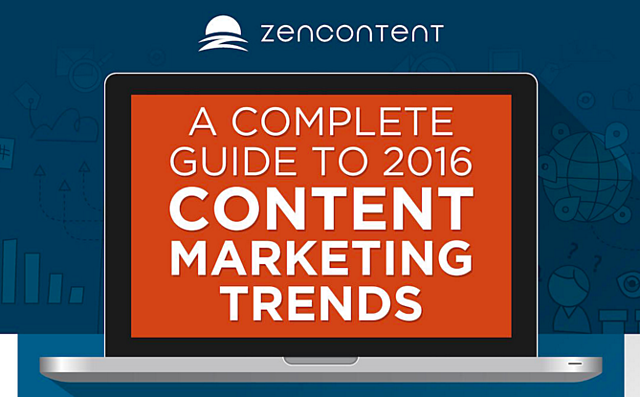 Peruse ZenContent's infographic below for all of the statistics and tips you need to make your 2016 content marketing strategy a success. Like what you read? Be sure to subscribe to our blog below.